This chapter illustrates how study abroad experiences can become a key component of an adult learning program. Adult learning educators may face many challenges in the ever changing demographics of the workforce today. Whether a corporate trainer, healthcare professional, literacy and/or English as a Second Language instructor, most adult educators find the need to have a greater understanding of the global environment. Graduate students benefit from international experiences which transform learning by expanding students global perspectives. 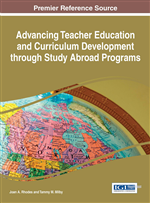 This chapter explores an inaugural study abroad program in the Adult Learning Graduate Program in the Department of Teaching and Learning at Virginia Commonwealth University. The chapter describes both the challenges and reflections of students and faculty while abroad. Malcolm Knowles' Andragogical framework is the foundation of this study abroad experience. Experiential Learning (Kolbe 1984) and Transformative Learning (Mezirow, 1999) are also explored through students' reflections on the study abroad experience. Study abroad programs have traditionally been geared toward undergraduate students (Lantis & DuPaglia, 2010). However, graduate students are finding that study abroad is essential to develop perspectives of a global nature, along with the ability to work with others in diverse settings (Dirkx, Millar, & Berquist, 2014). According to these authors, graduate students have different reasons for pursuing study abroad experiences, such as networking, pursuing possible research projects, and personal development. Most study abroad experiences undertaken by graduate students are considered short-term courses of four weeks or less, offering academic credit, and do not include a foreign language competency. The most popular of these programs are interdisciplinary in nature and expose graduate students to a variety of experiences (Dirkx et al., 2014). Adult learning graduate students, both Master’s degree and Ph.D. levels, tend to be experienced practitioners. Most enter graduate studies after several years in a career working with adult learners or are interested in changing careers to an occupation in teaching adults (Tisdale, Taylor, Wright & Greenwalt, 2013). Students come from a variety of fields, including corporate training and development, management, non-profit organizations, health care related fields in which teaching adults is part of their responsibilities, higher education, working with adult learners of English as a Second Language, and basic adult education, such as GED preparation. The common thread among all of these students is teaching and learning with adults. Adult educators today must be prepared to both live and work in a globally diverse society (Merriam & Bierema, 2014). They must also have the skills necessary to face increasingly complex challenges and problems, which are diverse and global in nature. Study abroad programs are viewed as one way to enhance adult educators’ perspective of the broader global society (Cushner, 2009), as well as instill an awareness and empathy for citizens of other countries and cultures (Schattle, 2009). A study abroad experience also provides an intersection between academic and experiential learning (Brewer & Cunningham, 2009). Study abroad has been said to transform individuals’ view of the world (Lantis & DuPlaga, 2010; Brewer & Cunningham, 2009), as well as teach individuals to appreciate the differences of other cultures and worldviews (Hovey & Weinberg, 2009; Lantis & DuPlaga, 2010). Hadis (2002) believes that students grow personally and intellectually from experiencing learning and development in other cultures. These experiences may help to prepare the adult educator to relate to the student population they serve, whether working in a multinational organization, a non-profit that works with a multicultural population, or as an English as a Second Language instructor. Experience in another culture has also been viewed as having a transformative potential (Brewer & Cunningham, 2009). This may provide participants with a changed mind-set, which in turn, could assist adult educators in working with the diverse populations they serve.